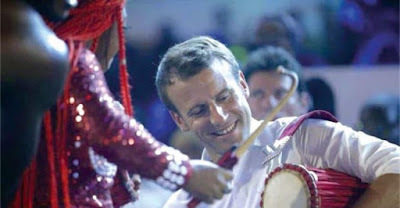 France's President Emmanuel Macron has visited the famous nightclub built in honour of legendary musician Fela Kuti in Nigeria’s commercial capital, Lagos. Fela, who died in 1997, pioneered the Afrobeat sound and was known for his sexual exploits, marijuana smoking and being a fearless critic of military rule. The French leader – who spent six months as an intern at the French embassy in Lagos in the early 2000s, according to the BBC told reporters travelling with him, “I like Nigeria a lot. It’s an appealing country. I’ve got a lot of memories… that haven’t left me”. In 1977, Nigerian soldiers burned down the legendary concert hall where Fela Kuti performed his protest music that popularized the Afrobeat genre and earned him millions of loyal followers around the world. Kuti was despised by Nigeria's military rulers for his controversial songs that mocked corrupt officials, criticized colonialism and encouraged Nigerians to question their leaders' lavish spending. Kuti died in 1997, but on Tuesday, the New Afrika Shrine in Lagos — which replaced the original club and is now managed by two of Kuti's sons, Femi and Seun, also both musicians — welcomed French President Emmanuel Macron. His visit to the Shrine, believed to be a first by a sitting president, stole the spotlight from Macron's earlier extremism-related meeting with Nigerian President Muhammadu Buhari and somewhat shifted the focus of his trip to a celebration of African youth and culture. “It may be a surprise that a French president goes to the Shrine, but it never surprises anyone if I go to the Albert Hall or the Met. We have to change that,” The Washington Post quoted Macron to have said.